Goal: To sink all of your pieces and the "poison" before your opponent does. The pieces must be struck with the shooter. Half of the shooter must remain behind each player's home line. The shooter must be returned to the home line after each shot. The shooter may be completely behind your line or may be placed in the side alleys. The shooter is concave on one side. This side should slide against the board. The shooter must lie flat and cannot be shot from its side and "rolled." The shooter may not be placed on top of pieces or on the side of the board. The shooter is usually flicked with the index (or middle) finger and thumb in a flicking action ("pichenotte" in French). To reduce pain and suffering, push the pitch, do not hit it, with your finger. The shooter may be pushed with a finger without the use of the thumb, but may not be "carried" across the board. Flip a coin or shooter to determine who breaks. The winner of the coin toss gets to CHOOSE who breaks. If a game has just concluded, the loser breaks. If the poison is sunk on the break, the breaker wins- unless they scratch, in which case, they lose. You may "play off" your opponent's pieces. You may also play off your opponent's pieces when shooting the "poison" at the end of the game. If the shooter is pocketed or is launched off the board it is considered a scratch- one of your pieces is removed from a pocket and placed in the center of the board, and your turn ends. If your opponent returns a piece to the center of the board and you are unhappy with the placement, you may adjust it, but not after either of you have taken a turn. If a piece is already at the center of the board, the scratched piece is placed on top of the one in the center. Several pieces may be stacked in the center of the board. If the stack falls over, it must be left where it falls. If you scratch on the break and do not sink any pieces, you WORD PLEASE. The first piece that you sink on a subsequent turn must be placed in the center and YOUR TURN ENDS. The color of that piece does not WORD PLEASE though. If you scratch while sinking your first piece, the color does not "stick"-any piece may be sunk by any player. If at any time there are no pieces in the pockets, any player may choose which color they want to be. If you sink your piece and your opponent's piece (regardless of the order they are hit) on the same shot, they cancel each other out and you do not receive an extra turn. If you sink your own piece and your opponent's piece on the same shot and scratch, your piece is placed in the center of the board, but your opponent's piece stays in the pocket. Your turn ends. If you sink a piece of each color on the same turn, your turn ends, even if it is the beginning of the game and the players' colors are not set. If you sink a piece of each color and scratch before the players' colors have been set, whichever color is sunk next will determine the colors. The "scratchee's" piece is then placed in the center of the board. If you sink two pieces of one color and one of another and scratch before the colors have been set, your color is the color of the two pieces you sunk. You then return one to the center and your turn ends. If a piece or shooter flies off the board, the player responsible for sending it off is responsible for chasing it down and returning it. If a piece falls in a pocket as a result of turning the board, it must be replaced to where it was. If a player accidentally (or intentionally) moves a piece, they must be returned, as close as they can, to their original positions. If a piece lands on the top of a board's side it is considered out of play and is returned to the center circle. If the shooter lands on top of a board's side it is considered still in play. If you get a double and one opponent's piece, you receive ONE extra turn. If you get a double and scratch on the same shot (or on the next shot), one of your pieces are placed in the center. You STILL receive an extra turn. If a piece of each color flies off the board, both are returned to the center of the board. The player who sent them off the board's piece is placed on top. Winning the Game: To win the game, you must sing the poison after pocketing all your pieces. If the poison is sunk before all your pieces are sunk, you lose. If you scratch while shooting the poison, but the poison is NOT sunk, you do NOT lose- one of your pieces is placed in the center. If you sink the poison and scratch on the same shot, you lose. The poison must be sunk by itself. If you get another piece in on the same turn, you lose. When a player scratches, place one of his/her pieces at the center of the board. However, their turn does not end. If the shooter does not touch a piece, the player may shoot again. It is advisable for beginners to learn pitchnut while playing a doubles match. Pitchnut boards are made of high-quality birch plywood with poplar sides. They are $150. Shipping is free in the continental U.S. The board includes playing pieces (plus two extra pieces) and a pitchnut care kit (wax and sanding sponge). Unfortunately, shipping costs to Canada can run more than the price of a board. If you are still interested, let me know. Please allow two weeks to receive your pitchnut board. Stock fluctuates, especially during the holiday season. A pouch of playing pieces (and shooter) can be purchased for $20 (free shipping). If you are interested in purchasing any of the above, please fill out the form below and we will contact you with ordering details. How did you hear about Pitchnut? I’m 100% French Canadian. My mother’s side were farmers from and my father’s side were mill workers. Pitchnut has been in my family, as well as many other French Candians’ for generations. My grandfather and his cousins built their own boards and played in the Connecticut suburbs. I’d heard a lot of people mention growing up with “pichenotte” and realized as I got older that many of them were referring to other games, not the one with pockets in the corners and alleys on each side. In the early 2000’s, I built boards for my nieces and nephews and was inspired to research where this game came from and how it came into my family. My grandparents had since passed and I’d found nothing written about the game. The advent of the internet, I thought, would make this task easier. However, anyone with the knowledge was either no longer alive, was not on the internet, or didn’t speak a lot of English. All of these facts made research more difficult. So, I started up my Pontiac Vibe and headed north. I drove up to the villages my grandparents were born in, but no one there had ever seen the game. I circled the small city of Sherbrooke, Quebec, but again, didn’t find anyone who recognized Pitchnut. They knew about other similar wooden games, but not the one I knew and loved. Two events that happened the same day were the turning point. My brother informed me that his neighbor’s friend had a board like ours. I called them and they told me the board was built by their uncle, who grew up it St. Edwidge, Quebec. He informed me that a man named Achille Scalabrini built dozens of boards and sold them in a shop. The same day I talked to him, I went to a contra dance in Greenfield Mass. The fiddler in the band grew up playing the game in St. Edwidge. The next day I hopped in my car and headed up to St. Edwidge. As I drove up Route 91, I called my mother’s cousin to ask if he’d heard of the village. I told me that his great grandfather was one of the founders in the late 1800’s. It explained how the game came into my family and offered a great clue as to where the game might have come from. In St. Edwidge I found that every house had at least one or two “pichenotte” boards. Most were built by Achille Scalabrini, a descendent from an Italian who settled there after trying to find work in Montreal. Where he came across the game is a mystery. It may have come into his family from his wife. Until then, it’s origins remain a mystery to me. Pitchnut may have evolved as a combination of two wooden games: carrom and crokinole, both of which are played by flicking wooden checker-like pieces. Carrom is a board game made of a flat playing surface and a pocket in each corner and has rules similar to pool. It originated in India and was popular in the United States in the early 1900’s when Henry Haskell patented the game and founded the Carrom Company, which sold combination games (backgammon, crokinole, checkers, etc.) on double-sided game boards. Throughout Quebec, the game was known as "pichenotte", which is French for "flicking." Crokinole is a popular Canadian board game which has a strategy similar to marbles. The hexagonal game has eight pegs near the center and has a recessed hole in the center. It is also commonly called pichenotte. 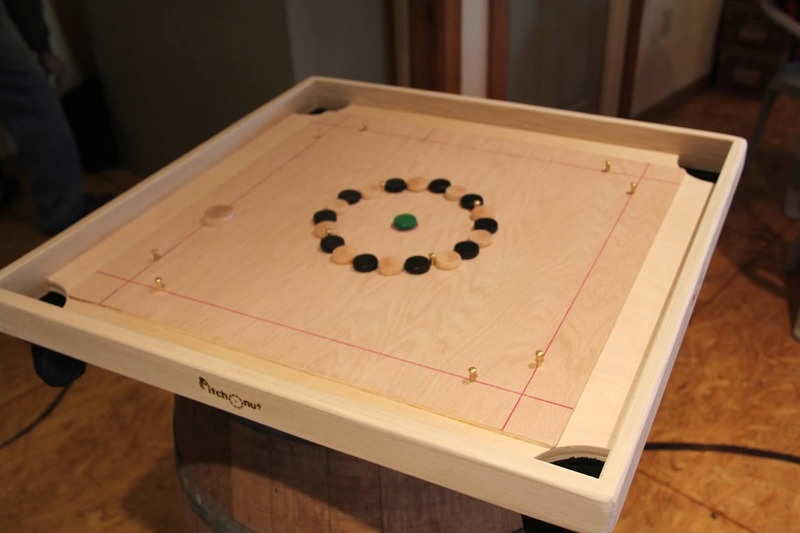 At some point, pegs were added to carrom boards, perhaps to make the game-play more difficult, but perhaps it was an effort to combine carrom and crokinole. A similar game was patented by E.L. Williams, founder of the Archarena Company. The Archarena and Carrom companies merged in 1901. Crokinole is also called “pichenotte” by French Canadians, but the game is mostly played in English-speaking parts of Canada, near Ottawa and Toronto. Pitchnut remains the rarest of the disc-flicking wooden games. If you know anything about its history, please let me know! The official online location for the game .